1951-52 West Virginia inspection sticker - $20.00 : Bob Hoyts Classic Inspection Stickers, Add a Final Touch to your Restoration! 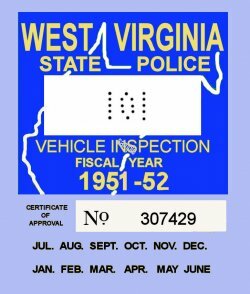 This 1951-52 WV inspection sticker was created from an old nearly illegible original. It was believed WV began it's official statewide Inspection program in 1955.